She studied with Gary Hoffman and Christophe Roy. Cello teacher in the Ecole Municipale de Musique de Tarnos (France) - Diplôme d’Etat de Violoncelle. 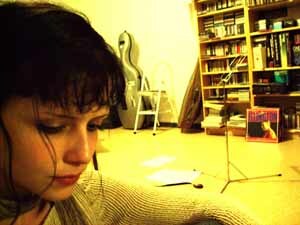 Alone, she plays contemporain and classical repertory and also plays and sings her own compositions. As an actress, she played in the movies of Jose Luis García Sanchez, Juanma Ortuoste, Imanol Uribe, Manolo Gutierrez Aragón and Toni Abad.